Joffrey’s Coffee and Tea Company can be found everywhere you look at Disney resorts and parks! From the coffee you have in your room, to coffee shops and carts in the parks you are sure to get a nice cup of coffee to give you the energy you need to kickstart your morning! 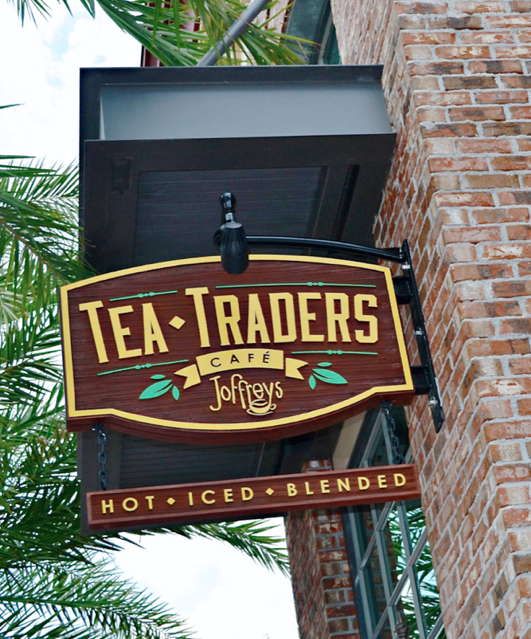 Recently, Joffrey’s opened a new location at Disney Springs called “Tea Traders Café.” This elegant new location is home to a unique tea company! This location offers unique experiences and delicious drinks! You can stop by quickly to grab an iced tea to cool down from the Florida sun, or you could have a seat to sample some of the delicious and hand blended teas created in front of you from Joffrey’s Master Tea Smiths during their unique demonstrations! At Tea Traders Café, you will be able to experience tasting exotic teas from the finest tea gardens around the Globe! Tea Traders Café also offers some tasty pastries such as chai brownies and tea bag shortbread cookies. If you find a tea you really enjoy, you can buy teas right in the store. This café is a complete all-in-one experience that is very unique! You can also checkout the Joffrey’s online shop when you run out from your Disney vacation! Be sure to stop by the new Tea Traders Café at Disney Springs to enjoy a delicious tea as you explore the new shops!